The current implementation of the units is just a wrapper for the libsbml UnitDefinition class. Definition at line 21 of file CSBMLunit.h. Definition at line 12 of file CSBMLunit.cpp. Definition at line 25 of file CSBMLunit.cpp. Definition at line 33 of file CSBMLunit.cpp. Definition at line 40 of file CSBMLunit.cpp. The current implementation only supports integer exponents. Definition at line 104 of file CSBMLunit.cpp. References isDimensionless(), mSymExpExp, and mUD. 111 // could not apply numeric exponent because of symbolic exponent !!! This method applies a symbol as an exponent to the unit. The result is not really a valid unit itself, but the exponent can cancel out later during the calculations (via applyInverseExponent() ). 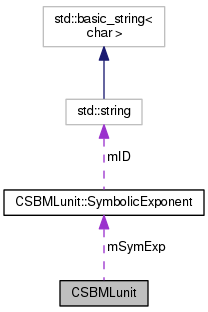 In the current implementation, a string and an integer (sbml id + frame stack index) are sufficient to uniquely identify a symbol within one expression. In other words: Once we know the frame index the ID is unique. Definition at line 122 of file CSBMLunit.cpp. References isDimensionless(), CSBMLunit::SymbolicExponent::isEqual(), mSymExp, and mSymExpExp. 135 // could not apply symbolic exponent !!! Definition at line 140 of file CSBMLunit.cpp. 153 // could not apply inverse symbolic exponent !!! Definition at line 44 of file CSBMLunit.cpp. References CSBMLunit::SymbolicExponent::mID, mSymExp, mSymExpExp, and mUD. Definition at line 69 of file CSBMLunit.h. Referenced by Expression2PresentationMMLUnits::getMathML(), and CSBMLunitInterface::writeBackToModel(). Definition at line 70 of file CSBMLunit.h. Definition at line 72 of file CSBMLunit.h. Definition at line 73 of file CSBMLunit.h. Definition at line 88 of file CSBMLunit.cpp. Referenced by CSBMLunitInterface::handleOneExpression(), CSBMLunitInterface::initializeFromSBMLModel(), CSBMLunitInterface::recursionDivide(), and CSBMLunitInterface::recursionTimes(). 95 // could not invert units because of symbolic exponent !!! Definition at line 175 of file CSBMLunit.cpp. Referenced by applyExponent(), applyInverseExponent(), invert(), isEqual(), and multiply(). Definition at line 159 of file CSBMLunit.cpp. References isDimensionless(), CSBMLunit::SymbolicExponent::isEqual(), mSymExp, mSymExpExp, and mUD. Referenced by CSBMLunitInterface::handleTerminalNode(), and CSBMLunitInformation::isEqual(). Definition at line 60 of file CSBMLunit.cpp. 83 // could not multiply units because of symbolic exponent !!! Definition at line 90 of file CSBMLunit.h. Referenced by applyExponent(), applyInverseExponent(), getDisplayString(), isEqual(), and multiply(). Definition at line 91 of file CSBMLunit.h. Referenced by applyExponent(), applyInverseExponent(), getDisplayString(), getSymbolicExpExp(), invert(), isEqual(), and multiply(). Referenced by applyExponent(), CSBMLunit(), getDisplayString(), getSBMLUnitDefinition(), invert(), isDimensionless(), isEqual(), and multiply().